Doha (AFP) – The US and Qatar plan to expand Al-Udeid airbase, the biggest military facility used by Washington in the Gulf as it battles jihadists, Qatari state media said Tuesday. The two countries have also discussed making Al-Udeid a “permanent” base, the official QNA news agency said, as Doha seeks to bolster ties with Washington at a time of tensions with its Gulf neighbours. QNA said representatives from both countries on Tuesday “laid the foundation stone for expanding” Al-Udeid. But the Pentagon played down the development, pointing out nothing concrete had been decided. “It is premature to discuss aspects of a potential base expansion at Al-Udeid air base in Qatar,” Lieutenant Commander Rebecca Rebarich said in a statement. “The US military is working with the Qatari ministry of defence on further details of the proposal to help us to plan appropriately and ensure we will use any new facilities effectively,” she said. According to QNA, the project includes “the construction of barracks and service buildings to support joint security efforts, as well as improving the quality of life of the troops stationed at the airbase”. Around 10,000 US troops are deployed in Al-Udeid, the largest US base in the Gulf where Washington stocks munitions and equipment and deploys warplanes used in the battle against the Islamic State group. Other members of the US-led coalition fighting IS in Syria and Iraq are also deployed at Al-Udeid, located 35 kilometres (20 miles) southwest of Doha. QNA said the expansion project “underscores Qatar’s commitment to deepening its strategic military relations with the United States”. “The State of Qatar, along with its strategic US ally, is working on drawing up a roadmap for the future of bilateral relations, including the addition of Al-Udeid Air Base to the list of US permanent military bases,” it said. Ryan Gliha, the US charge d’affaires in Doha, echoed this in remarks at a news conference after the ceremony to lay the foundation stone for the expansion of Al-Udeid. “We saw today the opening of a new construction project… what we hope to see in the coming years and months is (the) strengthening” of bilateral ties, he said. “Billions of dollars have been spent already at Al-Udeid over the last 15 years to support our operations… These are essential to the fight against Daesh and our ability to lead the coalition,” he said, using an Arabic acronym for IS. Gliha described Qatar as an “indispensable partner for the United States”. In April, US President Donald Trump welcomed to the White House the Emir of Qatar, Tamim bin Hamad Al-Thani, for talks on improving bilateral ties that had been strained by Qatar’s row with Gulf states. The year-long crisis has seen regional kingpin Saudi Arabia and a number of its Arab allies impose a diplomatic and trade embargo on Qatar. Trump had initially supported an economic blockade on Qatar, but aides — mindful of the pivotal role of Al-Udeid in US Middle East operations — convinced him to take a more moderate approach. Featured Photo: US AIR FORCE/AFP / Joshua HORTON. 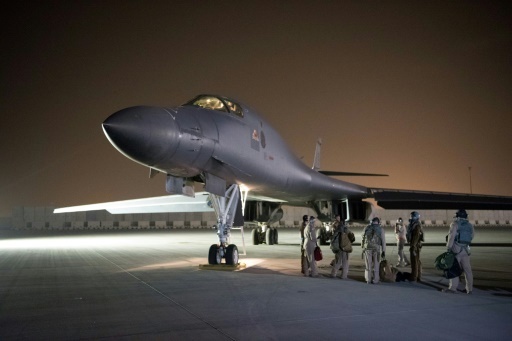 In this image released by the US Air Force, airmen with the 379th Expeditionary Maintenance Group perform preflight checks on a 34th Bomb Squadron B-1B Lancer aircraft at Al-Udeid Air Base in Qatar on April 13, 2018.